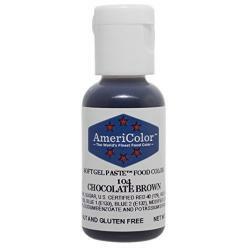 Americolor premium quality Soft Gel Paste food colors. Available in 3 sizes and 41 colors. Color, buttercream, royal icing, rolled fondant and more. Americolor Soft Gel Paste is package in a squeeze bottle with a convenient flip-top lid - making it easy to measure by drops to achieve the precise and repeatable colors. Americolor Soft Gel is super concentrated - use less color the achieve bright and vibrant colors every time.